Though she's been relatively quiet in the aftermath of her 2008 debut, Santigold has certainly been keeping busy. Hard at work on the album's follow-up, she's also found time to lend a production hand to some musical idols. According to an interview with Paste [via Pitchfork], the singer born Santi White has been in the studio with new wave pioneers Devo. While the details are sketchy, the tracks might be for Devo's long-rumoured new album. "They're just, like, my band idols," White said. "Them and the Smiths. 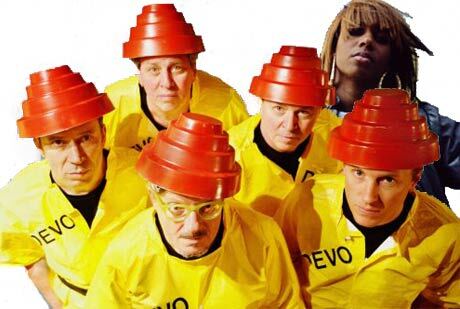 But Devo, I made them pull out the red hats and pose for a picture." Here's hoping that picture surfaces somewhere soon.